New Product Inspection Machine for Tablets and Capsules, Model PIP-500. Products enter the inspection stage in a single-layer from the vibratory chute, and are placed on rotating rollers which enables a reliable all-sided inspection. 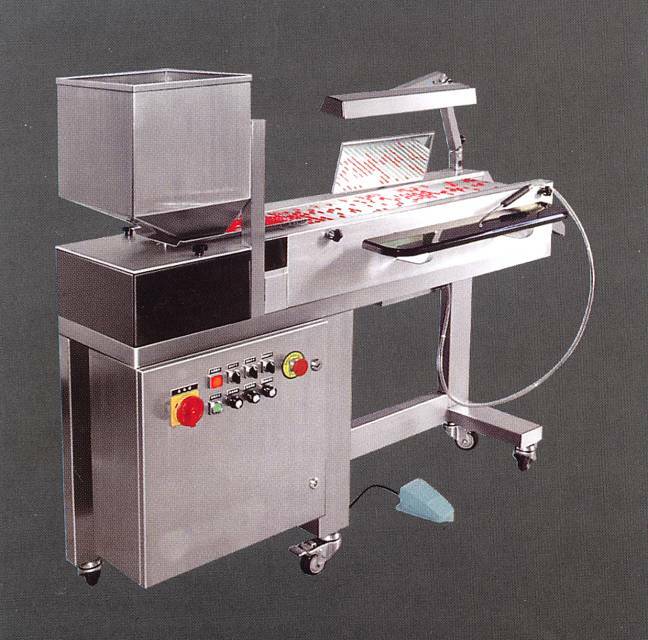 Features: adjustable mirror for inspecting opposite parts, provides ergonomic work station for inspector, lighting source can be fixed on top and also underneath the roller conveyor belt (illuminating the product from below, allowing inspection of transparent capsules),defective capsules and tablets can be eliminated by the operator with a flexible handheld vacuum nozzle, foot pedal switch to stop the conveyor belt at any time, non-flash fluorescent light (reducing eye fatigue). The machine can be completely dismantled without any tools within a few minutes. No noisy vacuum cleaner necessary through the use of compact Venturi suction system. Technical Data: Application: hard or soft capsules, plain or coated tablets, round and/or cylindrical objects. Min. Tablet Thickness: 3mm. Output: up to 120,000 capsules/hr. or approx. 50 Kg tablets (depending on product types and sizes). Feed Hopper: 30L, 60L. Electrics: 1/60/110 Volts. Power Output: 0.45 Kw. Compression Air: 0.6 Mpa. Dimensions: 1400 x 650 x 1250mm. Weight: 120 Kg. Comes with a Limited Warranty. Delivery Time: 4 - 6 weeks from receipt of a 60% deposit.